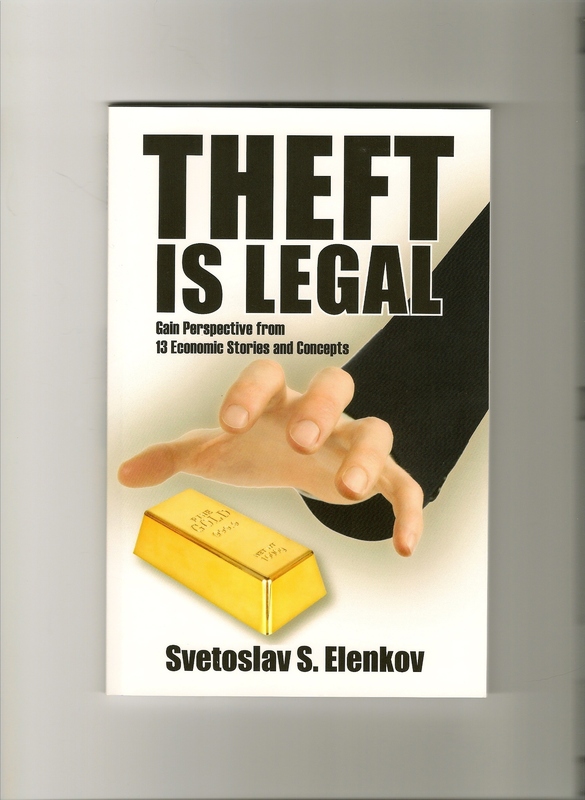 Svetoslav Elenkov’s Theft Is Legal is a handsome book that provides a short and easy read, although it promises much more. With an expressive cover photo by JupiterImages Corporation, a promising blurb on the back cover, and an expansive array of distribution channels, the book seems to have the potential for commercial success. In thirteen short chapters, Elenkov shares a couple of composed snapshots of life in Eastern Europe (Bulgaria) during the 1990s, leading to his family’s decision to immigrate to the USA; he presents his opinion about the works of different political systems, including classic socialism and capitalism, focusing on the deeds of the general institution of government; and he offers his ideas about “fixing” the problems that arise in the world of economics and politics regardless of geographical or political borders. Each of the thirteen chapters in the book is introduced by a simple, cartoon-like drawing. The stylish and artistic illustration lends a breezy undertone to the paperback, and definitely enhances its content. The chapter titles are clever and provocative. The content, on the other hand, is erratic and hard to describe. The chapters vary wildly regarding tone, genre, subject matter, and even quality of writing. The only underlying theme I recognized is a frontal attack on government, regardless of what political system it serves or represents. Beyond that, Elenkov’s ideology and forms of expression seem to be rather eclectic. Dramatic memoir pieces mix with an oversimplified, didactic fable (The Ruins of Currency Island, p. 71) about world economy irrespective of political environment; a self-admitted rant (Government as a Barrier to Business, p. 43) mingle with a “how-to” article describing a generic internet marketing strategy (Buzz-Bomb, p. 23) and a disturbingly callous op-ed piece that rejects the efforts of non-profit organizations in favor of a crude, for-profit business plan (For-Profit Better than Non-Profit, p. 31). In Chapter 3, “The Emergence of Money”, the author leads the reader along his learning curve regarding the history of currency by depicting his epiphany while playing a popular video game, which probably was developed based on – what else? – the history of money. The more you know about economics and politics, the more simplistic – and at times naïve – Elenkov’s ideas seem. Because of the lack of cohesion in style, topic, genre, or theme, the short opinion pieces published in Theft Is Legal represent content more appropriate for a blog site than a book. On the other hand, with in-depth research, any one of the chapters could be developed into a powerful nonfiction book that fits in or even create a specific niche, especially considering the author’s radical slant. The most heartfelt pieces, the ones Elenkov calls “memory recollections”, depict life in his old country in Eastern Europe during the 1990s. Chapters 1, 7, and 13 retell the experiences of one family in a time of political and, consequently, fiscal turmoil, when the improvement of economy lags behind drastic political changes, thus crashing the dreams of millions who expect instant prosperity. Although I wanted to read more of this type of information and writing, even these chapters lack depth and clarity. What was the purpose of the road blocks the author participated in building? What were the political rallies about? What did the crowd chant? Elenkov keeps me hanging: “I don’t remember a word of what the speakers said during those times. It was boring,…” (Rock Pile City – A Recollection, p. 81). Nonetheless, I consider Elenkov a very brave man. He is courageous enough to go out on a limb and shout his personal truth into the wind. Agreeing or disagreeing is the reader’s choice. I wish he used at least some of the devices of persuasive, expository, or general nonfiction writing, such as research, analysis, supporting details, references, and so forth in order to back up his ideas and convince the reader of his truth. Otherwise his words remain just that: a cry in the wind.